Can you judge a Microsoft constituent by the bag he or she carries? Microsoft is evangelizes its hundreds of products and dozens of initiatives to key groups within the so-called Microsoft ecosystem through a handful of regular shows.There's Tech•Ed for IT professionals/customers; the Worldwide Partner Conference for partners; WinHEC, which hits a combination of OEM and system builder partners along with developers; the Professional Developers Conference (PDC) for, ahem, developers; MIX for the Web 2.0 crowd; and Convergence for Dynamics customers and partners. To paraphrase George Orwell in "Animal Farm," some of those constituencies are more equal than others. 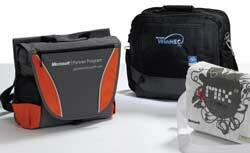 Judging by the bags, the WinHEC attendees appear to be the darlings of the Microsoft world. The bags tend toward luggage quality with a lot of stylish black and heavy-duty zippers. Attendee bags [from left] from a Microsoft Worldwide Partner Conference, a Microsoft Hardware Engineering Conference (WinHEC) and from MIX. PDC is harder to generalize about-the upcoming show in October will be the first since 2005. Microsoft obviously put out some serious coin for the stylish design of the MIX08 bag (see photo, below). The IT attendees at Tech•Ed may not get something as fashion runway-ready as the MIX bag, but they consistently get rugged, high-quality bags with innovative designs-from messenger bags, to backpacks to sharp shoulder bags. Professional-looking black or gray are the underlying colors. Lions and Gazelles and Partners, Oh My! Microsoft COO Kevin Turner brought a little Animal Planet to the Microsoft Worldwide Partner Conference (WPC) in Houston. During his keynote, Turner showed a short clip that set what we hear is a common MBA program parable (and motivational poster fodder) to footage of lions and gazelles in the savannah. "Every morning in Africa, a gazelle wakes up. It knows it must run faster than the fastest lion or it will be killed. "Every morning a lion wakes up. It knows it must outrun the slowest gazelle or it will starve to death. "It doesn't matter whether you are a lion or a gazelle... when the sun comes up, you'd better be running." Are partners supposed to be lions or gazelles in this parable? We're not sure. Hey, the ambiguity is what makes parables fun. Be careful out there. Lower on the totem pole are attendees at the WPC, where loud orange is the recurring color, and, in 2008 at least, the bag's clips, zippers and material have a less substantial feel than their developer and IT counterparts.